Search Articles, using keywords that describe your problem, for help on a specific issue. To search, enter key word(s) in the input field and click Search. Alternatively, you can browse by topic through the available content. Search results return both Articles and Q&As that match your query. 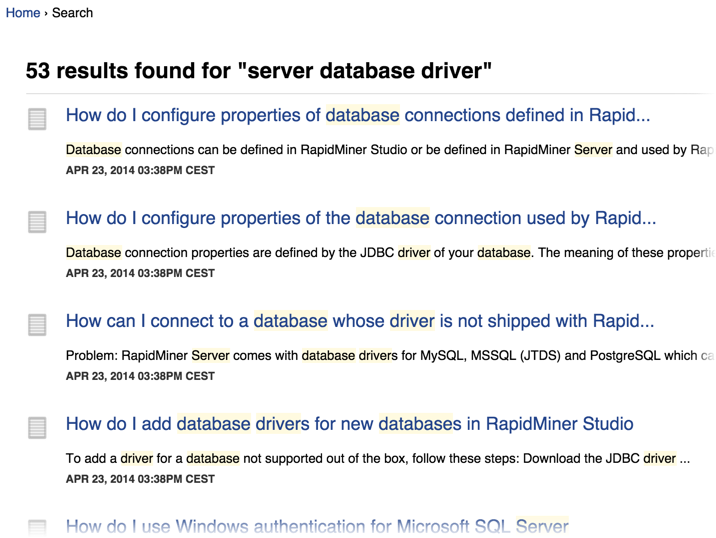 For example, if you would like to add a new database driver for use with RapidMiner Server, you could enter the search terms "server database driver." The system returns a pop-up of results, from which you can select an Article. Or, click Search to return matching documents to a results page. Problem description — Used to add clarity for more complex problems and to help you evaluate whether the article is applicable to your issue. Problem guide — Instructions on how to resolve the problem. Follow the instructions carefully to resolve your problem. When you are finished, consider rating the Article to help us improve the clarity and accuracy of the instruction. We appreciate it! You can search, ask, or answer questions using Q&As. Search Q&As using the same keyword technique as Articles uses. Click Post a public question in the menu on the right. Select a Topic from the drop-down menu. Enter a relevant — and catchy — title for your question. The more precise your question, the easier it is for those browsing to be helpful (which will drive up the response rate). Complete the description by providing content and background about your question. Describe your problem in detail. You cannot upload files or screenshots, but you can include external links (for example, using Dropbox) to useful clues. Do log files contain useful information? Copy and paste the relevant parts. Is a process not behaving as you expect? Copy and paste the XML. Complete the form and click Ask Question. Your question immediately appears on the Support home page under the topic you selected. At your convenience, check back at the Support site for responses. Files cannot be attached to public questions. Instead, search the logs for errors and exceptions (use time stamps to help) and copy the relevant rows into the description. The entire content of your question will be publicly visible to everyone. Do not enter private data such as passwords and names. rapidminer-studio.log .RapidMiner subdirectory of the user home directory RapidMiner Studio log file. 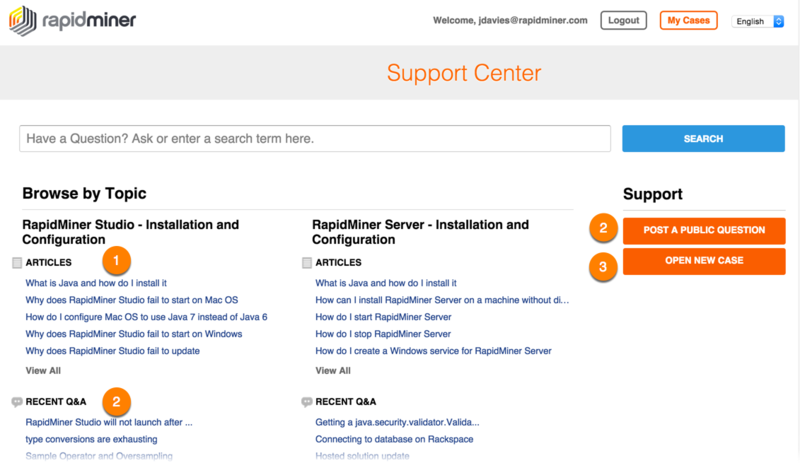 launcher.log .RapidMiner subdirectory of the user home directory Information about the startup process (for problems starting RapidMiner). log <Install Directory>\standalone\log RapidMiner Server log files. 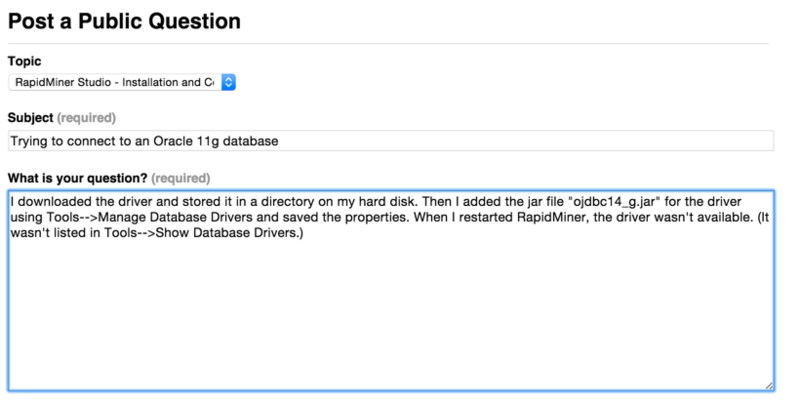 By default, each day RapidMiner Server logs all activity and change files. Note that you can also access log file information from within RapidMiner Studio. Open the Log view. Any error encountered after the splash screen is contained in this log file display. 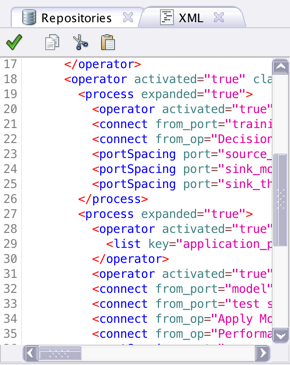 In RapidMiner Studio, open the XML view (from the View > Show View > XML menu item). Select the complete text and copy it to the clipboard. Paste it into the description. 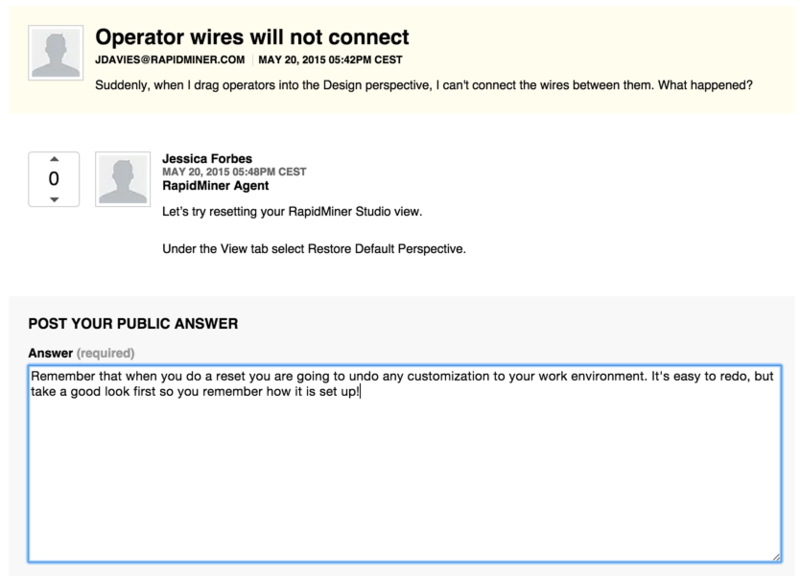 If you would like feedback on a process or RapidMiner operator use, include a sample process showing the problem. That is, recreate the process making sure it can run either without data or with an included sample data set. Your sample should not depend on any external resources, such as files or databases, since users trying to answer will not have access to those dependencies. Note that a process definition may contain passwords, if you are specifying them as an operator parameter. Be sure to check for — and replace — any private data. Browse questions from the Recent Q&A topics on the Support home page. If you see a topic you can contribute to, click the link. You can see any previous responses.You are free (and encouraged) to contribute. Give explicit, clear, and precise instruction. Be sure to include all the steps necessary to resolve the problem. Remember, a precise and easy-to-follow answer will be rewarded with a good rating! If you're an Enterprise customer, you can use the Cases option to provide guaranteed, personalized problem resolution if your problem isn't answered by one of the options above.